Detailed review of Neutrogena Deep Clean Gentle Scrub. See how it stacks up against other exfoliators! 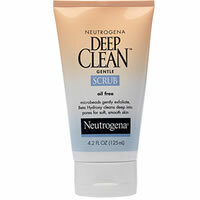 Neutrogena Deep Clean Gentle Scrub earned 3 out of 5 stars from me. Overall, I found it to be a nice daily exfoliator. This scrub is extremely gentle and is good for those with sensitive or oily skin. However, if you’re looking for deep exfoliation this is not the product for you. But on the flip side, it’s great for those of you who are looking for a mild, daily exfoliator. Neutrogena Deep Clean Gentle Scrub smells amazing, is inexpensive and can be found at most local drug stores, which are all pluses in my book. So overall, I liked this product. The main thing I didn’t like was that I didn’t get quite as good of results as I do with some harsher exfoliators. Neutrogena Deep Clean Gentle Scrub is a very thick, white scrub. It comes out of the tube with a creamy, lotion-like texture. However, you can definitely feel the microbeads in this product that give it that gritty, scrub-like consistency. It has a very light orange scent to it. It’s very faint, but I found it extremely refreshing! I really enjoyed using this one in the morning because the smell helped me wake up and was very clean smelling. Neutrogena Deep Clean Gentle Scrub is recommended for daily use. This product is very easy to apply– just massage into wet skin, rinse and pat dry. Although the application of this product is very simple, I found it a little difficult to completely rinse it off. I had to rinse my face a few more times than I expected due to the thick, lotion-y texture. I always find it annoying when a product really sticks to my face and is hard to wash off. This scrub is extremely gentle; therefore I didn’t experience any drying of redness while using it. I found the results to be pretty good for a daily exfoliator. Immediately after using this scrub, my skin felt very clean. I have pretty oily skin so I absolutely loved how this product really helped removed oil and residue I currently had on my skin. However, immediately after use I still had some areas of dry skin that the product didn’t remove. I didn’t feel like the exfoliator was harsh enough to remove all the dead skin it needed to. It may have removed one layer of dead skin, but it definitely left a few big areas of dead skin on my face. So this one is super gentle. I’d recommend it for daily use or for those of you with sensitive skin. However, if you’re looking for a really good deep exfoliation (which we could all use from time to time) this is not the product for you. So, it did make my skin feel clean and smooth, but I didn’t experience a deep exfoliation. Overall, the results were above average, but could have been better with a harsher exfoliator. Although, this is a very gentle exfoliator, I like that it includes both chemical and physical exfoliating agents. Neutrogena Deep Clean Gentle Scrub uses beta hydroxy as its main chemical exfoliant. Beta hydroxy is included to cleanse your pores, and help dry up excess oil. This scrub also includes microbeads as its main physical exfoliant. Although microbeads get the job done, they supposedly aren’t great for the environment. To buy Neutrogena Deep Clean Gentle Scrub, click here.